Bristol Type 142M Blenheim: The Bristol team headed by Frank Barnwell designed the Type 142M during 1935 as a three-seat light bomber derivative of the type 142 Britain First. To transform this sleek civil demonstrator into the Type 142M Blenheim bomber was not an easy job. The task was a major redesign: of the wing centre-section and fuselage (raising the wing to mid-fuselage to provide for a bomb-bay stressed for 1000lbs); of the nose (to provide navigating and bomb-aiming positions beside the pilot); of the rear fuselage (to add the dorsal turret and radio operator's position); and for provision of all the associated military equipment (turret hydraulics, flares, bombing and gunnery hardware, radio, hatches, dinghy, external hard points); and re-stressing of the airframe for military use. Result: a 19% increase in empty weight (from 6,300lb to 8,100lb) for a 2,400lb or 24% increase in all-up weight to 12,200lb (though weight reports vary) and the raising of the tailplane by 8". A major redesign by any standard. A contract for 150 Type 142M’s to Specification 28/35 was placed by the Air Ministry in September 1935 and the name Bristol Blenheim was adopted in April 1936. 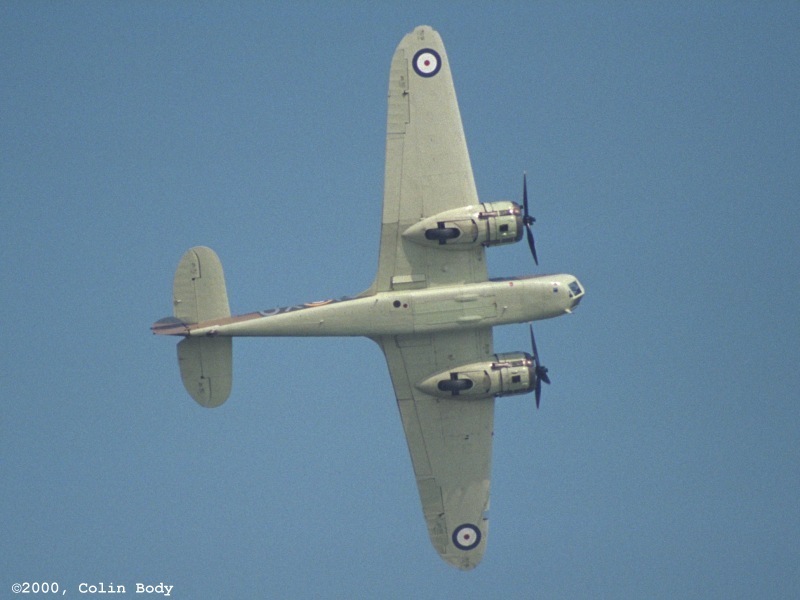 First flight of the prototype Blenheim (K7033) was on 25th June 1936. 14 months after the Britain First flight. Service trials followed, and the design was given final production approval in December 1936. The first service delivery (K7036) on 10 March 1937 was just short of 2 years development since the "Britain First" flight, and not far short of 4 years from Barnwell's initial twin design. Successful conversion. Bristol Blenheim I: Production contracts for 150 in 1935 and 434 in 1936, and 134 in 1937 to make a total of 718 built by Bristol, plus 250 by Avro at Chadderton and 422 by Rootes Securities at Speke. Two 840 hp Bristol Mercury VIII engines. One fixed forward firing 0.303” (7.7mm) Browning gun in port wing and one 0.303” (7.7mm) Lewis gun in a Bristol B.I Mk.I powered dorsal turret. Internal bomb load 1000lbs (454kg). Bristol Type 142M Blenheim I Cutaway. Initial deliveries commenced to No114(B) squadron in March 1937 and 16 other home bomber squadrons and 13 overseas bomber squadrons between 1937 and 1939. 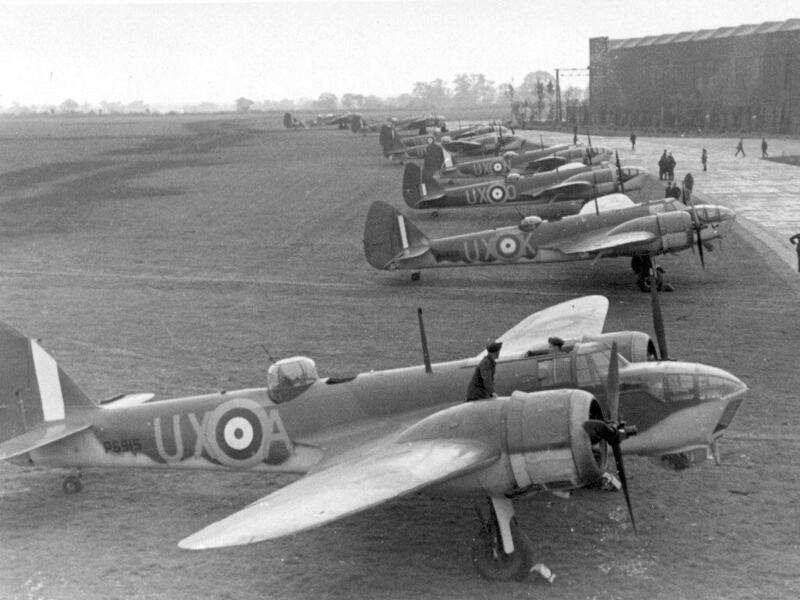 Blenheim I’s went out of front line service in the UK by September 1939 but remained operation overseas, notable in the Western desert and Greek theatres. Type 135 2xAquila. Design only July 1933. None built. Type 142 2xMercury. One ordered March 1934, and built: Britain First. Allotted civil registration G-ADCZ but unused. Flown 12 April 1935. To the RAF and allotted R-12 experimental June 1935, until taken on charge and allotted K7557 July 1935. Type 143 2xAquila: test bed. One only built. Allotted G-ADEK March 1935, flown January 1936 and to the RAF as R-14 but retained at Bristol Filton. Type 142M 2xMercury VIII. Proposed July 1935. Design August 1935 Air Ministry Spec 28/35. Air Ministry production order 150 aircraft September 1935. First Type 142M Blenheim prototype: K7033 June 1936. First service delivery K7036 March 1937. Max speed, 285mph (459km/h). Cruising speed, 200mph (322km/h). Initial rate of climb, 1,540ft/min (7.82m/sec). Service ceiling, 32,000ft (9,754m). Range, 1,125 miles (1,810 km). Empty weight, 8,100lb (3,677kg). Gross weight, 12,250lb (5,561kg). Span, 56ft 4in (17.17m). Length, 39ft 9in (12.12m). Wing area, 469 sqft (43.57m²). 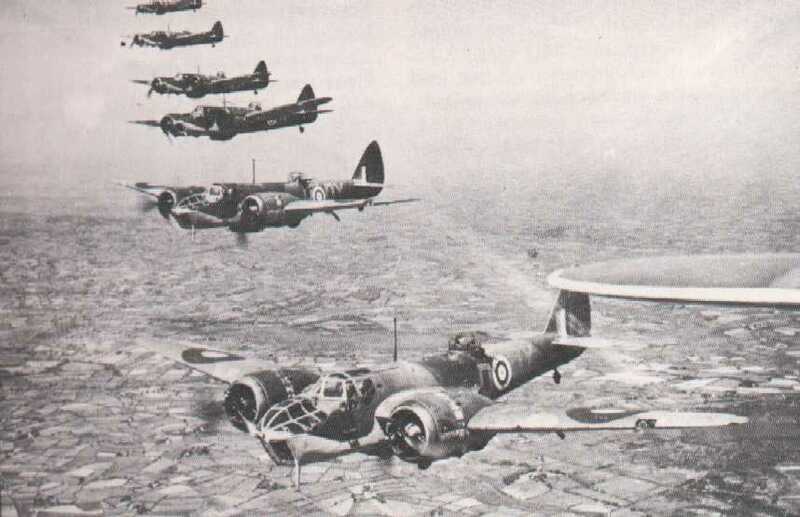 Bristol Type 149 Blenheim IV: In 1937, with Type 142M Mark I production well in hand, Bristol put forward a tender to Air Ministry Spec G.24/35 (general reconnaissance), entitled Type 149 and eventually leading by a rather tortuous specification and tender path to the Type 152 Bristol Beaufort torpedo bomber. Meanwhile, with initial encouragement from the Air Ministry, the Bristol design team put forward a much simpler development of the Type 142M, transferring the Type 149 designation to this new project. The aircraft was basically a Blenheim I with the nose lengthened by 3ft (0.91m) to provide space for a navigator/radio operator ahead of the pilot. It was initially named the Bolingbroke I with 134 ordered to specification 11/36. The prototype was a converted Blenheim I (K7072) which was flown on 24th September 1937. It entered production after changes to nose shape and the introduction of long range fuel tanks in the wings. It was renamed Blenheim IV for the RAF but Bolingbroke was retained for Canadian production versions. Contracts for 312 aircraft were placed with Bristol in 1937-38, plus a further 750 built by Avro at Chadderton and 2,060 by Rootes Securities at Speke and Blythe Bridge. Powered by two 920hp Mercury XV engines with an initial armament consisting of one fixed forward firing Browning and one Lewis or Vickers K gun in the dorsal turret, both of 0.303” (7.7mm) calibre. Later the aircraft were fitted with one gimbal mounted nose gun, one or two rearward firing Brownings in a Blister under the nose and two Vickers K or Browning guns in the dorsal turret. The bomb load was 1,000lbs (454kg) internal and 320lb (145kg) external. 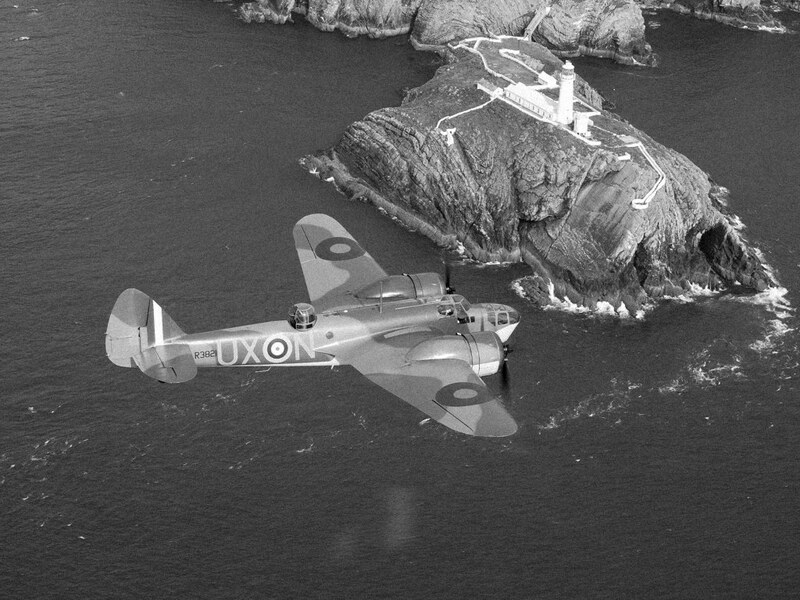 Deliveries began March 1939 to No90 squadron, it equipped a further 18 squadrons by August 1939. The first sortie of World War II, behind enemy lines, was carried out by a Blenheim IV of No139 squadron on 3rd September 1939. Max speed, 266mph (428km/h). Cruising speed, 198mph (319km/h). Initial rate of climb, 1,500ft/min (7.82m/sec). Service ceiling, 27,260ft (8,309m). Range, 1,460 miles (2,350 km). Empty weight, 9,790lb (4,445kg). Gross weight, 14,500lb (6,583kg). Span, 56ft 4in (17.17m). Length, 42ft 7in (12.98m). Wing area, 469 sqft (43.57m²). 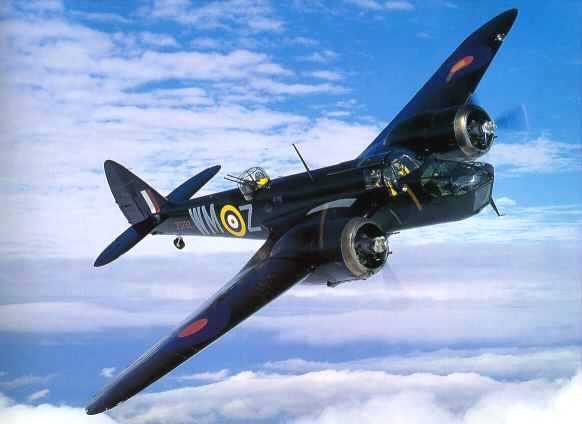 Bristol Type 160 Blenheim V: The Bristol 160 was proposed during 1940 as a variant of the Type 149 Blenheim IV specifically intended for short range bombing operations in support of the army, with a secondary role as a bomber. Specification B.4/60 was written around this proposal and two prototypes were ordered, initially as Bristol Bisley I but renamed Bristol Blenheim V before the first flight on February 24th 1941. Production of the type totalled 942, by Rootes at Blythe Bridge, with 950hp Mercury 25 or 30 engines. The direct support version was armed with four 0.303” (7.7mm) Browning guns in a redesigned nose, plus two similar guns in a Bristol B.X dorsal turret. A high altitude bombing version had a navigation/bomb-aiming station in a redesigned nose with two rearward firing Brownings in a Frazer Nash mount. Initial deliveries were to No18 squadron in the summer of 1942 for operations in North Africa. 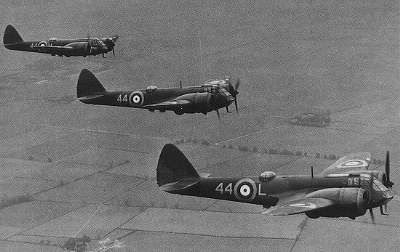 Some Blenheim V’s with dual controls and without dorsal turrets were used by Fighter Command OTU’s. Max speed, 260mph (418km/h). Service Ceiling, 31,000ft (9,450m). Range, 1,600miles (2,574km). Empty weight, 11,000lb (4,994kg). Gross Weight, 17,000lb (7,718kg). Span, 56ft 1in (17.09m). Length, 43ft 11in (13.38m). Wing area, 469sq/ft (43.57m²).